2016 has been an unforgettable year. For art, for politics, for life. There are now so many avenues for music that it’s easy for things to slip through the cracks. I’m still trying to dig through my own mountainous backlog of music, podcasts, movies, and games. 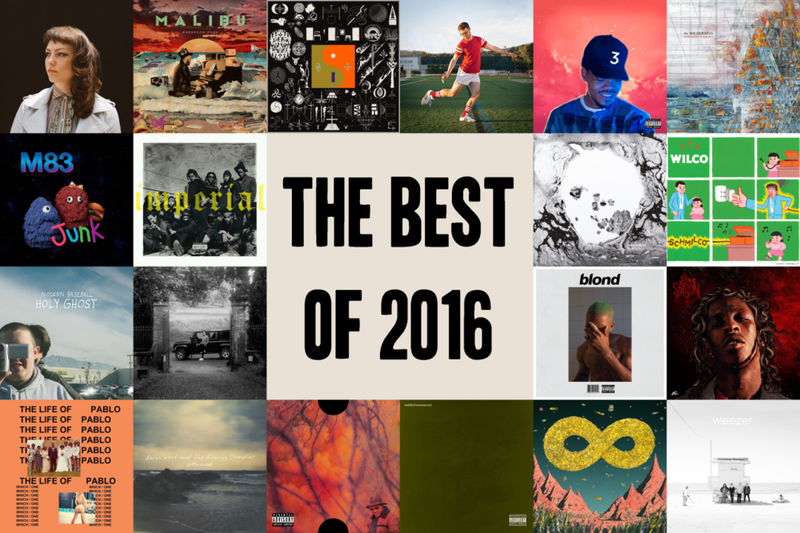 In a year of uncertainty, darkness, and constant change, these albums brought bright rays of hope and beauty into my life. Before I get into my top ten, I’d like to name a few honorable mentions. These are ten albums (in no particular order) that I found incredible, yet didn’t quite make it into my top ten. Obviously, I would recommend these albums (and the following ten) to anyone, but for one reason or another, these ten were all edged out by other releases this year. Now that I’ve named the runner-ups, let’s get into the good stuff, starting with number ten. 10 - Francis and the Lights - Farewell, Starlight! rancis and the Lights is the project (solo act?) of the futuristically-named Francis Farewell Starlite. 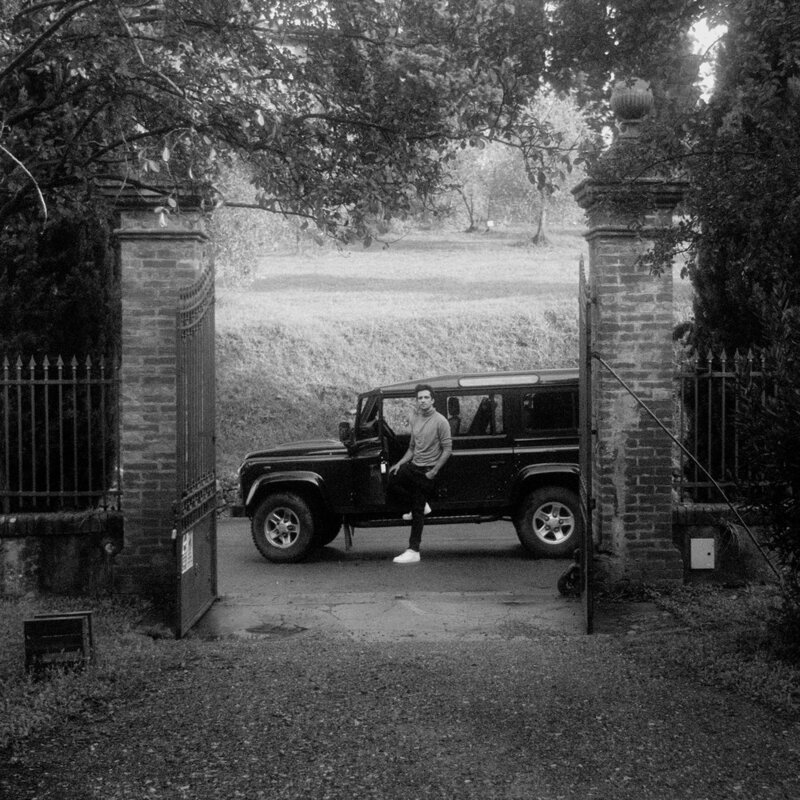 After surprising the world with his Bon-Iver-esque feature on Chance The Rapper’s “Summer Friends” earlier in the year, Francis released his debut album Farewell, Starlite! in late September. The album is “fall music” perfected, offering a wide array of spacey, introverted, jagged electronic sounds that all inspire the listener to look inward and absorb the world around them. The record shifts from dancey Michael Jackson impersonations on “I Want You to Shake” to somber reflection on “My City’s Gone” within a matter of minutes. Clocking in at a little over 30 minutes, Farewell, Starlite! is a pointed ode to Peter Gabriel wrapped in a neutral-colored turtleneck. Anything following M83’s critical darling and ambitious double album Hurry Up, We’re Dreaming was bound to be divisive and over-analyzed. 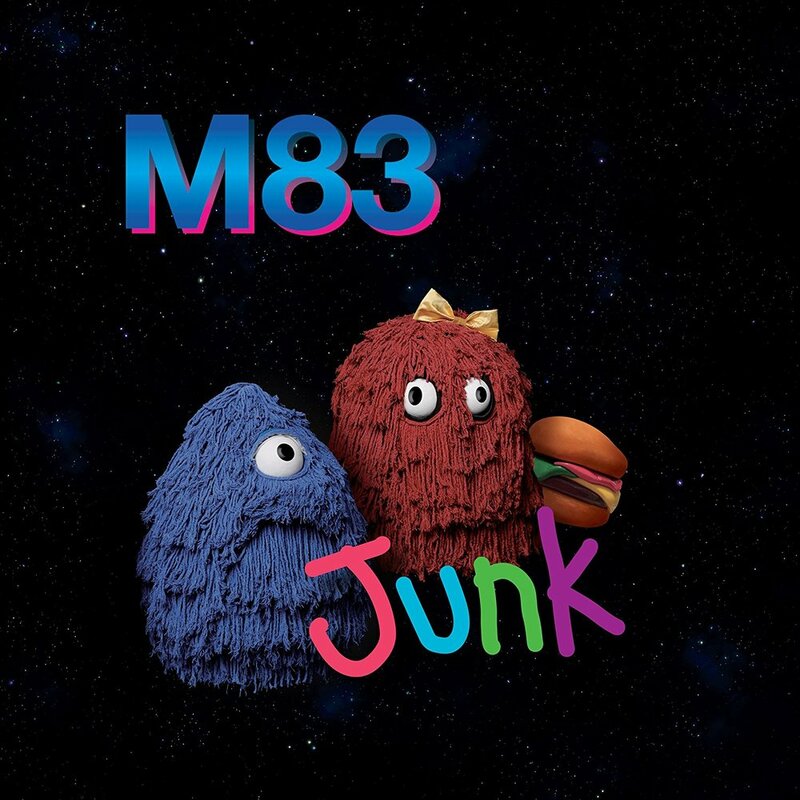 In the face of following up that artistic achievement with their seventh studio album, M83 decided to fully lean into 80’s nostalgia and unbridled cheese. If the space muppets and Play-Doh cheeseburger on the cover weren’t enough indication, this album has its foot firmly planted in two very different realms. After opening with the accessible but veiled “Do It, Try It” the band immediately launches into “Go!” an absolute monster of guitar wankery and anthemic drums. Several songs later, the record goes fully off kilter with “Moon Crystal” a song that sounds like it was ripped straight out an 80’s NBC interstitial alerting you that a new episode of Alf was up next. Junk as earnest as it is cheesy, it’s genuine about its love for corniness. I appreciate whenever an artist embraces both ends of a spectrum like that, especially following something as “artistic” as Hurry Up, We’re Dreaming. 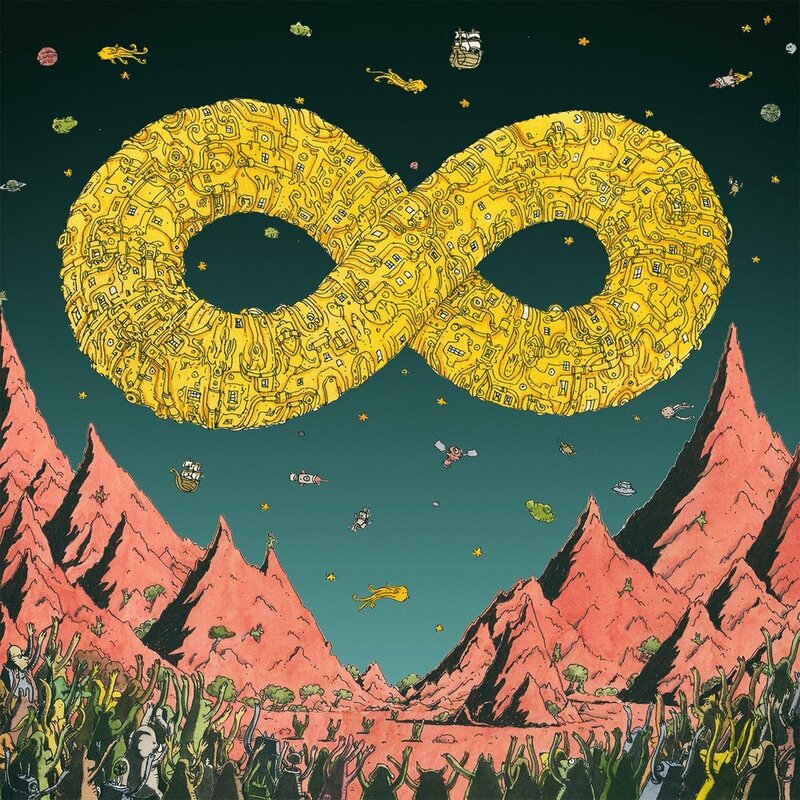 All these years later, there’s still a shell of angry metalcore kid left somewhere in me, and Dance Gavin Dance is living proof of that. After being mostly disappointed with the band’s previous effort Instant Gratification, I took a gamble on Mothership because it happened to release at a time when I had an extra $10 lying around. Their newest record represents a return to the band’s earlier darker sound without losing any of the humor, heaviness, or musicianship they’ve developed over the course of their decade-plus career. In fact, tracks like “Inspire the Liars” and “Man Of The Year” represent new artistic peaks for the band as every member seems to be exploring the bounds of their respective instruments. Mothership manages to bring the band into interesting new (even catchy) territories while still retaining what made them special in the first place. Tillian’s lung-collapsing scream on “Inspire the Liars” is one of the most impressive things I’ve ever heard in the genre, and single-handedly turned me back into a believer. 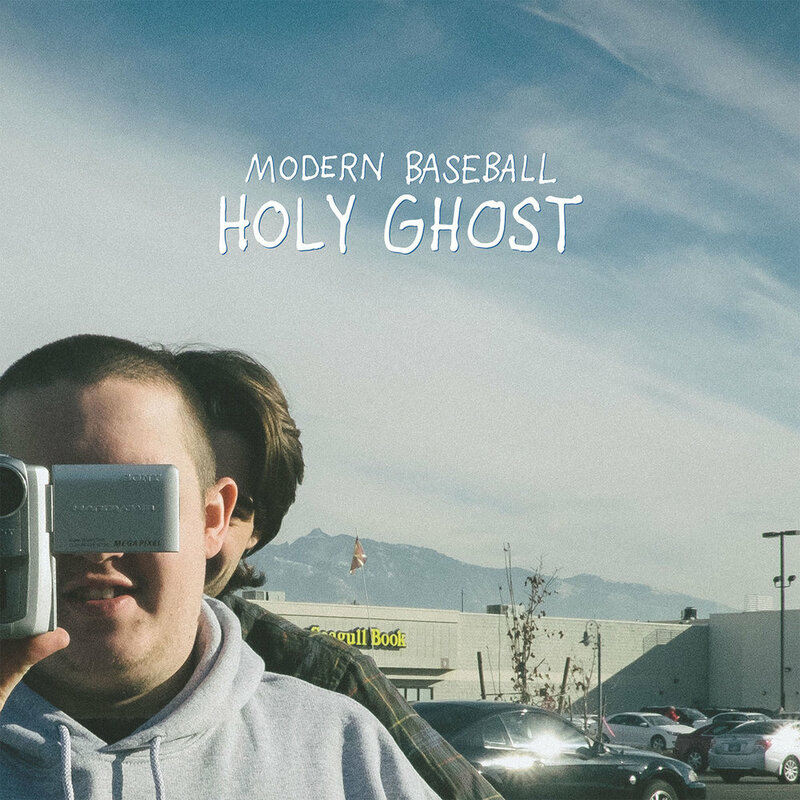 In a year of bands releasing follow-ups to albums I loved, I was most nervous about Modern Baseball’s Holy Ghost. The band’s previous album You’re Gonna Miss It All was an absolute revelation at the time it released in 2014 and represented an uplifting shift in the somewhat-stale realm of pop-punk. Their newest release may not be as catchy, immediate, or narrative as their last, but upon each listen Holy Ghost slowly reveals more of its layers to you. Split into two halves between the band’s dual frontmen, Side A addresses death and loss while Side B deals with Brendan Lukens’ ongoing struggle with depression. Heavy stuff for such a relatively upbeat half-hour, but the band manages to pack all that and more within a tight record that is eager to reveal its purpose to those willing to listen. After being propelled to the forefront of the underground hip-hop scene in 2015 with critical darling Barter 6, nearly 100 Young Thug tracks were leaked and released onto the digital winds of the Internet. The Slime Season series of mixtapes served as a way for Young Thug to (graciously) finalize a majority of those half-finished leaked songs. 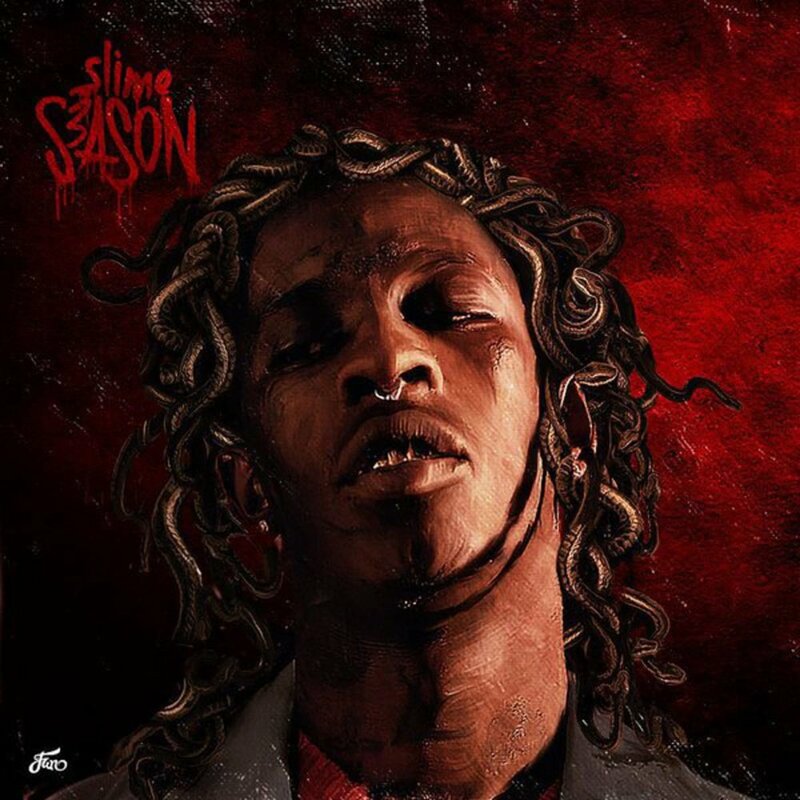 Slime Season 3 is the final installation in this series and represents the death of this period in Thug’s career. With 8 tracks stretched over 28 minutes, there was no room for error, no space for filler, and no time to waste. As a result, SS3 represents Thug at his most ferocious, lively, and spry. Hopping onto beats and careening over them like a car without brakes, this tape represents boundless creativity, energy, and excitement as he looked forward to his next phase in music. Slime Season 3 is perhaps the best sample platter of his arsenal of sounds, from his careless screams on “Drippin’” to his tender “Worth It” Thug jumps between different deliveries with ease and elegance. The tape is an absolute blast to listen to, and unfortunately, that’s something that music sometimes forgets to do. My Woman represented a defiant shift away from Angel Olsen’s previous role as an airy female folk guitarist and toward a grounded, psychedelic, indie rocker. Opening with the upbeat and clear “Intern” the album reveals its intention and purpose, then collapses losing all physical strength halfway through. The album’s third song “Shut Up Kiss Me” features a monstrous drum beat and an unwavering Angel Olsen on vocals as every instrument rapidly builds up to its dramatic crescendo. By the second half of the record, the party is over and the remaining four tracks have only enough energy left for spaced-out thoughts and introspection. “Sister” and “Woman” are both seven-minute epics with atmospheric builds that offer ruminations on what it means to be a woman in 2016. When I think back on 2016, it’s likely this album is what will first come to mind. Following his 2013 underground hit Acid Rap Chance the Rapper has slowly been building his Rolodex working with everyone from Skrillex to Quavo and honing his skills in the process. In 2015 he swung his weight around and helped release a surprise album for free on iTunes which is an achievement on its own. In early 2016 he dropped one of the most talked-about verses on “Ultralight Beam,” the opening track to Kanye West’s newest record. 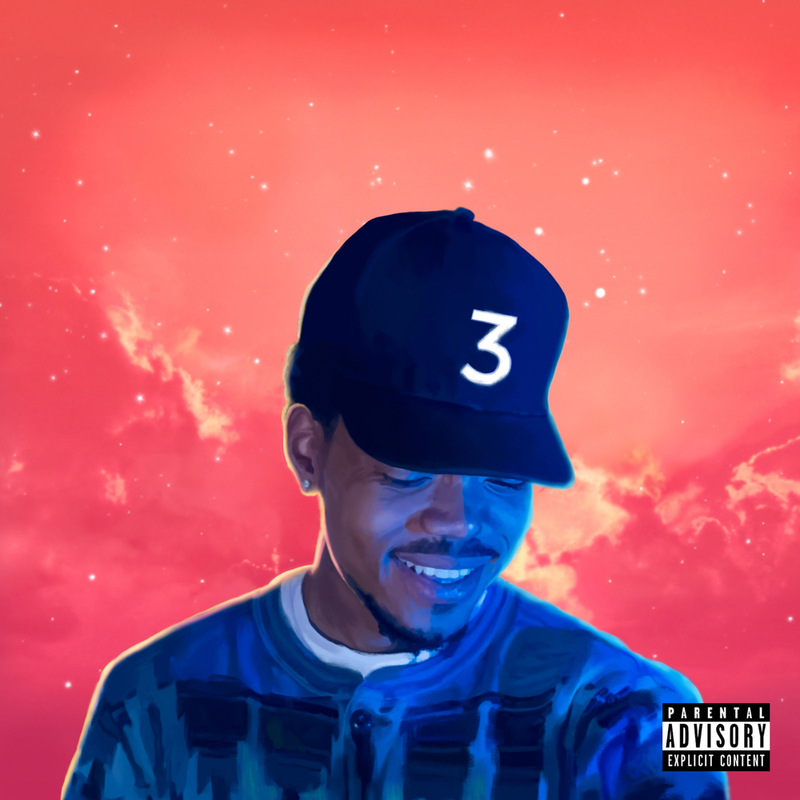 The gospel-influenced verse represented a symbolic passing of the torch to the new school of Chicago rap and quickly propelled Chance to an entirely new level of mainstream exposure. After the unparalleled success of his guest feature at the beginning of the year, Chance segued that momentum to his third mixtape Coloring Book. Inspired primarily by the birth of his daughter, Coloring Book goes from bouncy middle finger rap on “No Problem” to relationship woes on “Same Drugs” before turning away from all of that towards his family on “Blessings (Reprise)” Coloring Book represents an uncompromisingly bright, optimistic, and exuberant album in the face of a world that seemingly gets darker every day. Released on Mother’s Day, Radiohead’s first album in 5 years served as a universal gift of beauty and glimmering light to the world. 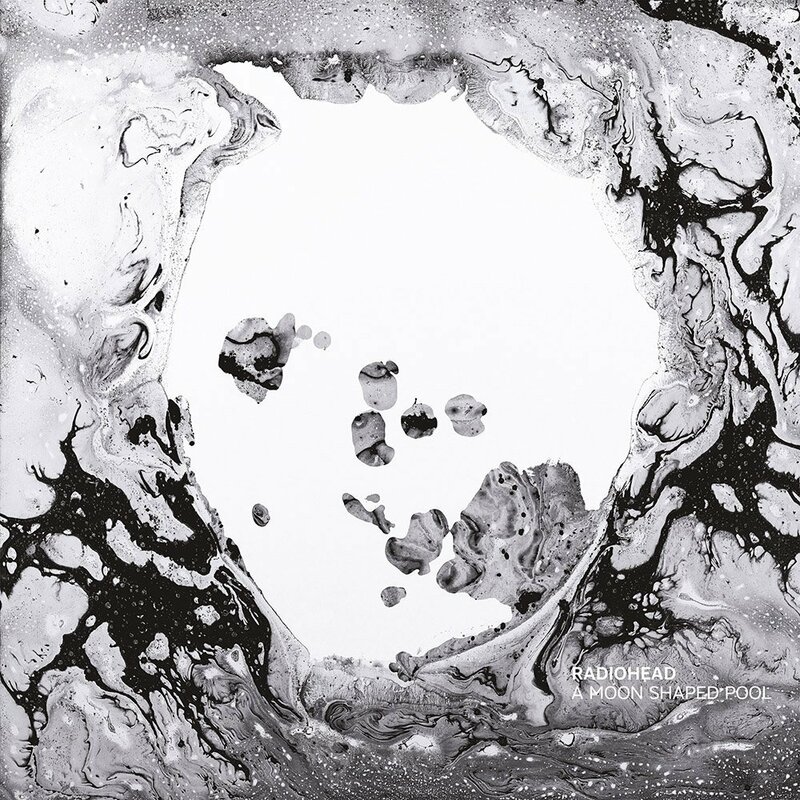 Aided by the Johnny Greenwood’s newfound orchestral skills, this record sees Radiohead revisiting a plethora of previously unreleased gems, now fully-realized and set in stone in a single gorgeous album. Sonically, the album is vague and formless. It wasn’t until about ten listens that individual tracks even became apparent to me. The album bleeds together in a beautiful and interesting way that makes it feel like one complete piece. It’s one journey that needs every part to work. The individual tracks are still there, but they’re a part of something bigger. The album’s final song “True Love Waits” is a haunting reflection of love lost, unrequited, and broken. It’s a solitary piece of sadness that the band sends the listener back into the world with. After fifty minutes of foggy, string-laden beauty, it serves as one final reminder that the world is still the world. You can only escape that reality for so long. As if there was any doubt after my recent Kanye-exaltation/defense, Kanye West’s controversial The Life of Pablo was a shoe-in for my top 10. Part of the joy of this album came from its rocky release painstakingly depicted here. The communal misery, speculation, uncertainty, coping, and conspiracy theories were a joy to be a part of, and led to some of the most joy-filled moments of my 20-year-long Internet career. More recently, the obsessive fan-created remix The Life of Paul has offered a fresh perspective on the beauty that lies at the album’s core. Even more recently, Kanye’s admission to the hospital following constant touring presents itself as a telling narrative on the media, mental illness, and the creators we hold so dear. The album itself is a schizophrenic jumbled mess that jumps between dozens of sounds within its jam-packed 20 tracks. It’s a testament to the time we live in, and our scattered perspectives in 2016. Every track on TLOP (including the interludes) has sentimental value for me. Every single one of them. The album single-handedly gave us Desiigner, elevated Chance the Rapper, and spawned one of my favorite memes of the year. 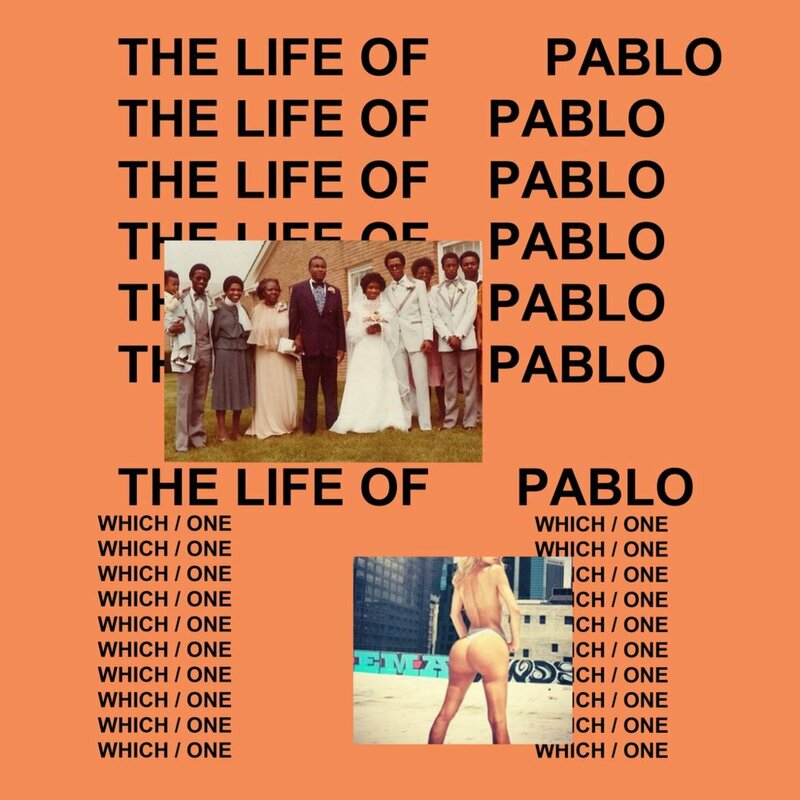 Additionally, Kanye’s strategy of “updating” the album after its release sparked discussions on what an “album” is in a streaming world. It’s been a pop cultural gift. Cultural impact aside, the music is some of the most honest, atmospheric, and self-aware that West has ever made. With topics ranging from prescription drug abuse to the birth of his second child, TLOP is a monument not only to Kanye, but to 2016 as a whole. Upon first listen it doesn’t feel like an album, more of a scattered playlist of tracks that could be put in any order and still work. I’d argue that’s the point. While Kanye’s previous releases have all had specific sounds and “points” to them, TLOP is utterly pointless, and maybe that’s the point. Following a four-year silence and years of delays, Frank Ocean emerged from his undisclosed monastery with a bizarre stair-building social experiment. After finessing his way out of his record deal with that visual album he released Blonde the very next day. It wasn’t what fans were expecting, or wanted, but it’s what they got. Blonde is Frank Ocean’s immortal monument. Sometimes only offering fragments of ideas in between skits, poetry, and social commentary, Blonde is an album that was meant to last. Every word of this album was planned. Every sound, every keystroke, and off-kilter delivery were meant to be. It’s a finely-crafted piece of beauty, and I can’t think of a single thing that could make it better. Midway through the album on the unsuspecting track “Self Control” Ocean gradually fades to silence as he repeats “I, I, I, know you gotta leave, leave, leave. Take down some summer time. Give it up just for tonight, night, night” and it’s one of the most beautiful, whole, and perfect things I’ve ever heard put to song. It’s crazy to say since I honestly wasn’t a fan of channel ORANGE, but I bought into the hype of this album and checked it out in a spur-of-the-moment decision. Upon first listen, the album sort of bleeds together as one amorphous dreamy piece, but upon re-listens, different moments peek out and reveal themselves. On a personal note, Blonde is inextricably tied to the Summer. As I wrapped up my final ties with school, internships, and countless different safety nets, this album represents the start of my new life. As I listened and re-listened to this album I also devoured Stranger Things (twice) and spent a week endlessly hiking around a riverside loop while on vacation at my personal heaven on earth Sunriver, Oregon. It was a dreamy, other-worldly state, and one that now comes over me every time I press play on this album. 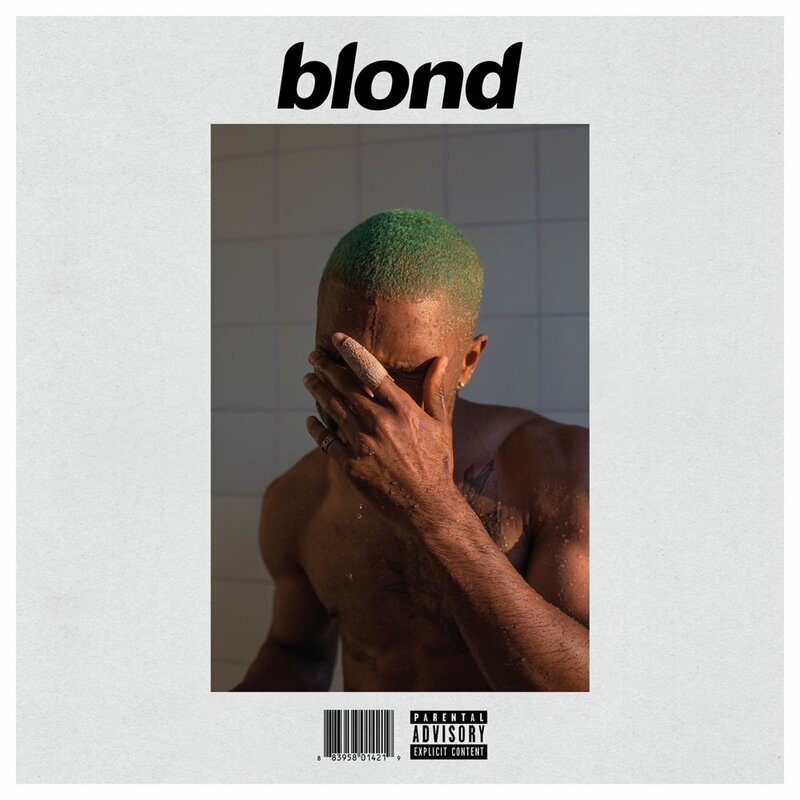 Blonde is a deeply personal album. It’s deeply personal to me, but more importantly, it’s deeply personal to Frank Ocean. It’s an out-of-body experience. It feels like I’m listening to a piece of Frank Ocean’s soul. It feels like a person encased in amber and etched into the grooves of vinyl. It’s absolutely incredible, breathtaking and unlike anything else in 2016.